SMARTPHONE PRINTER: Instantly print favourite photos from your smartphone. It&apos;s easy to use: Place film, place phone, and print! PORTABLE PHOTO PRINTER: No batteries or connection required. Take it anywhere! It&apos;s compact and folds flat for easy travel. CUSTOMISE: Add fun filters or just get rid of the red-eye and then use KiiPix to transfer those photos right to the film. You can easily print your pictures to hold on to! NO INSTANT CAMERA NEEDED: KiiPix only requires FUJIFILM Instax mini film (sold separately) and your phone to provide you with fun prints. THE BEST PICTURES: For the best pictures, make sure your rotation lock is on and that you turn the phone&apos;s brightness all the way up. KiiPix Smartphone Picture Printer is the easy and portable way to let the fun last forever. Making real memories with real pictures has never been easier than with the KiiPix photo printer. Open up your KiiPix, place your phone on top, push the button and turn the crank. The picture rolls out and you have a forever memory to keep or share. The only hard part will be choosing which pictures you want to print! KiiPix puts you in control. Unlike a traditional instant camera that often wastes film for blurry pictures, you can enhance the contrast or play with filter options before your photo prints. From fixing that annoying red eye to adding bunny ears or other fun filters, KiiPix lets you augment your own reality and then print it out to share with the real world. KiiPix™ is a portable instant picture printer that produces retro-stylised photos from any smartphone. KiiPix™ is easy to use, making it a "snap" to capture, print and share! 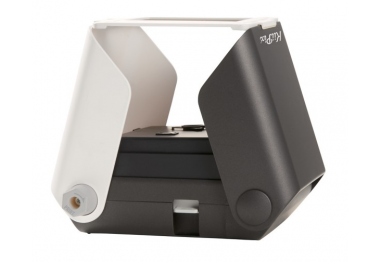 Simply place any smartphone on the KiiPix™ instant picture printer and print photos from your camera roll or Instagram.